After a 20 mile hike through the wilderness a cold beer or drink can sound really, really good. However, carrying a pint glass isn’t very practically when every ounce in a backpack count. While one could easily use a basic tin or the drink container, the beverage never tastes quite as good. Fortunately, someone has gone and invented a collapsing pint cup. 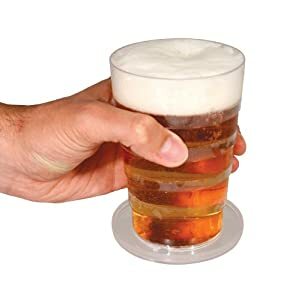 Crafted to fold into a compact form similar to the size of an ashtray, this compact beauty elongates out into a full pint glass, ready to be drank from anywhere. Made by Paladone, the collapsing pint glass elongates with a flick of a wrist and holds a full pint. So that one bottle you brought now chilling in the creek water can be drank properly with a full pint glass in the middle of nowhere. And you didn’t have to break a sweat carrying it either.